Atlogis offers Shaded Relief Maps with world-wide coverage. Shaded relief, or hill-shading, simulates the cast shadow thrown upon a raised relief map. Atlogis uses the best available sources of digital elevation data to generate relief maps with resolutions between 30 and 1000 meters. We offer different color modes and also a special greyscale shaded relief version that can be used to easily add hill-shading and illumination to conventional satellite images or topographic maps. Please visit Atlogis Map Shop and browse our large choice of relief maps. Use the Relief Map Configurator and choose individual extents, resolution and type of the map. Optional vector and elevation data can be ordered. Create realistic 3D views with 3D Configurator. Our shaded relief maps are generated from NASA SRTM data. SRTM data must be extensively corrected because the orginal data set contains massive gaps due to e.g. radar shadows caused by rock masses. For the alps and high asia these gaps were filled with newly generated elevation data from large scale topographic maps. 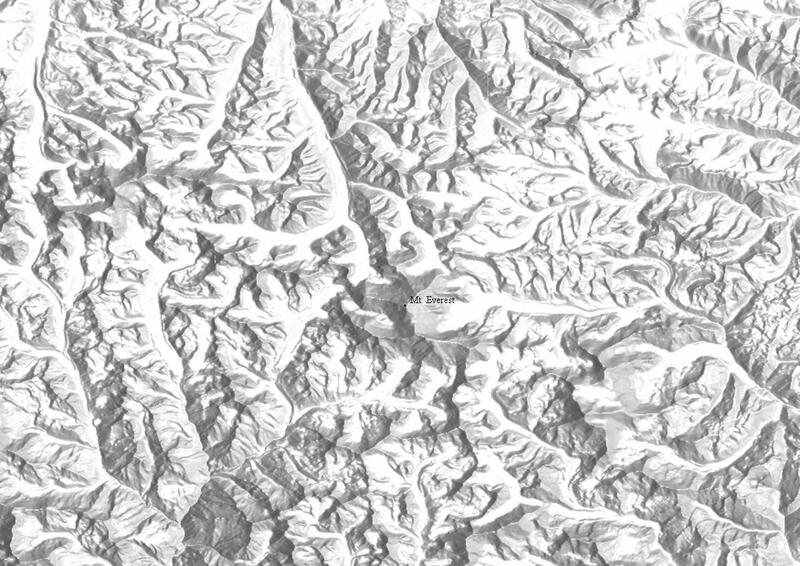 The result is elevation data that is far more accurate than the original SRTM data with 90 meters/pixel resolution, as you can see on this example Mt. Everest .